I've recently been making a point to stock up on some really great denim. And not just your typical blue jeans -- coated, patterned, and denim with details. I've found that these recent purchases have already become staples in my wardrobe and I'm loving the versatility that they've created. And fortunately, if you're looking to do a little shopping for amazing pairs of your own before fall really sets in, you're in luck! 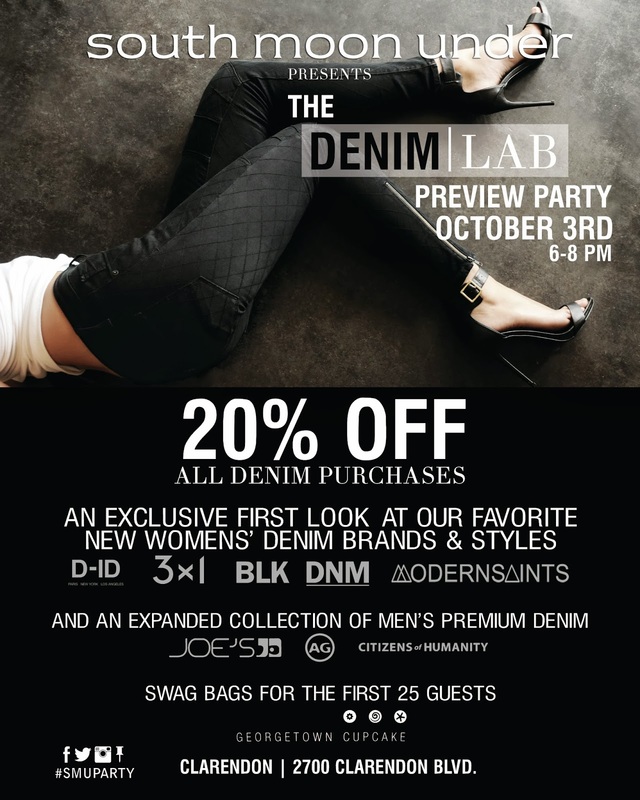 One of my favorite local stores, South Moon Under, is debuting their newly expanded collection of premium denim at a special Denim Lab preview party this Thursday, October 3, from 6-8 at their Clarendon store! Yes, friends, if you live in the area you're going to want to mark this one on your calendar! During the event, you'll have the chance to shop amazing brands such as Rebecca Minkoff (who recently launched her denim collection! ), Modern Saints, BLK, Saints LA, Frame Denim (a supermodels favorite!) and more. Enjoy fall cocktails and Georgetown Cupcakes while you browse, plus giveaways and swag bags for the first 25 people in line. And if that's not enough, you'll receive 20% off your denim purchase. Umm...yes please! Count me in! This is my go-to South Moon Under and I'm a huge fan of all the brands they stock!